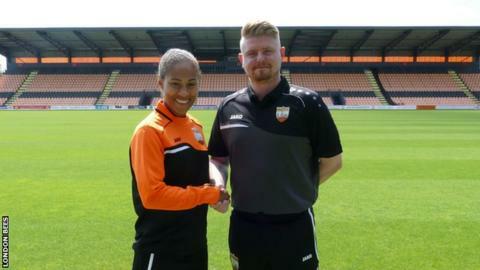 Former Arsenal and England winger Rachel Yankey has been named London Bees head coach for the remainder of the season. Yankey, 39, earned 129 England caps and will step into her first head coach role, having joined the staff at the Women's Championship club last summer. Her first game is at Manchester United in the FA Cup on Sunday, where she will face former team-mate Casey Stoney. Outgoing boss Luke Swindlehurst will start a new role in Barnet's academy. "I look forward to continuing to support the club and guide the team for the remainder of the season," Yankey said. Yankey is one English football's most decorated players having spent the majority of her career at Arsenal. She won eight league titles, nine FA Cups and a Uefa Cup with the Gunners, and a further league title and two more FA Cups with Fulham. In 2012 she represented Great Britain at the London Olympics, and a year later was awarded the OBE for services to football. Yankey's appointment means that in the two tiers of women's football - Women's Super League and Women's Championship - there are six female managers and five male managers in each division.